We are very sad to say that Samantha passed away last night (15th April 2008) aged just 5 years old. Thank you to everyone who has taken the time to write to Samantha throughout her time on Post Pals. Sympathy cards can be sent to the normal address on Samantha’s page. Samantha was diagnosed with Neuroblastoma Stage 4 on October 21st 2005 after intensive tests which included Xrays, CT scans, bone-marrow tests, blood tests, urine tests and a biopsy of the tumour was taken from her tummy. This nasty aggressive childhood cancer which affects under 100 children in the UK each year has spread throughout her little body. Over the next 6+ months our 2 year old little girl will have to endure intensive chemotherapy, surgery to remove the tumour and a kidney, Stem Cell Rescue (like a bone marrow transplant but Sam will receive her own bone marrow back, in stem cell form, which is like baby bone marrow seedlings) and further Chemotherapy. Samantha or “Sammy” as we call her is such a brave little girl and the whole family is behind her to help her fight the cancer every step of the way. As parents our biggest task is to keep her smiling throughout and her spirits up, and would appreciate any help no matter how small with this as laughter after all is the best medicine. Statistics will show that she only has a 25 % chance of beating this but as Cancer beater and Tour de France Champion Lance Armstong said “If Children have the ability to ignore odds and percentages, then maybe we can all learn from them. When you think about it, what other chance is there but to hope? We have two options, medically and emotionally: give up, or fight like hell”. We have found out that Samantha’s cancer has returned. She had been having pain in her arm which she is currently on Morphine for. An MRI scan showed a “large black mass” which is the Neuroblastoma. It breaks my heart to write this, but brave princess Samantha passed away last night. A huge thank you to each and everyone of you that has been kind enough to send Samantha an e-mail, card, gift, filled out her guestbook or have simply sent a positive thought her way. The love and support she has received is appreciated more than you could ever know. It is incredibly moving to think that she has touched the hearts of people in every corner of the world. What everyone at Post Pals does is priceless and really makes a difference to peoples lives. Each day when the post arrives, both Samantha and Louis are so happy to see they have mail and gifts. There have been several little cuddly toys sent which she insists sleep with her at all times. This is an impossibly difficult time at the moment and it seems a little inappropriate giving daily updates on her condition which I am sure you can all understand and I’m also very aware that any parent of a recently diagnosed child with Neuroblastoma may one day be reading this site to find out more information, the most important thing to remember is EVERY child is different. Samantha’s condition has worsened at a rapid rate as this truly awful disease begins to take over her tiny body. 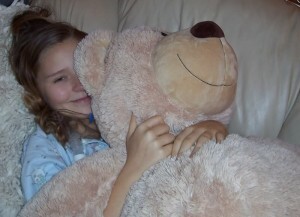 Samantha is now back home and on morphine, although not in pain and she spends most of the day asleep. It’s heartbreaking to see her in this way and looking so ill. In only a week she has gone from being the life and soul of the party to a very poorly girl with black eyes and various lumps and bumps beginning to show and has very little energy. Despite spending most of the day asleep and awaking very upset, every now and again she will return with a joke or a giggle. She really is an inspiration. We have had the worst possible news. Samantha’s Bone Marrow results have just come back and revealed the Cancer is everywhere and that further treatment or chemo could just make her worse and we may have to consider pain relief only so she can enjoy the time she has left. Thank you so much for all your love and support, please continue to follow Princess Samantha and her journey. Samantha had a Bone Marrow Aspirate on Monday, so we are awaiting results of this to see what we can do next. As for Samantha how is, she of full of life, laughing, singing and smiling as always. We have very bad news. Samantha’s Bone Marrow is full of Neuroblastoma, which means she is currently unable to have Stem Cell or MIBG treatment. She has started Etoposide chemo, and will scan again in a month’s time. Samantha is currently on morphine for a bad arm. A scan showed that Samantha has relapsed and Neuroblastoma has returned. Samantha has completed treatment and we now have a very anxious wait, hoping this disease never returns. Her next scan is September. Samantha is now back at Pre School and approaching her 4th Birthday. Currently taking Retonic Acid, she has a very, very anxious wait to see if she is clear from this nasty disease. She has won the battle but hoping to win the war. Samantha is near to the end of her treatment; she has several months of Retonic Acid and has many scans on the horizon which we pray will show that she is NED! Please keep fingers crossed for good news. I was having a difficult time with chemotherapy but I have been full of energy and having a great time recently. I’ve just got back from a little holiday. There is still Neuroblastoma in my bone marrow so I’m starting another 2 rounds of TVD chemo on Monday. It’s the first day of the month along with the start of my latest round of chemotherapy today in a bid to try and rid this nasty disease from my bone marrow once and for all. I am due 2 blocks, each block consists of 7 days of chemo, after this I will be taken for the usual scans to see if it is succeeding in reducing the cancer from my Bone Marrow. You may remember my previous treatment meant being hooked up to chemo for 24 hours at a time, so Mummy and Daddy were very worried at the thought of this stage lasting for 7 days at a time. However it’s not as bad as it first sounded because today’s chemo is only for 15mins, don’t get me wrong, it’s no walk in the park, but much better than we were expecting. This chemotherapy is called TVD and is a new treatment so keep your fingers crossed for me this week as I fear as the week goes on we may have familiar tales of temperatures, blood transfusions etc. Despite being dosed up on Morphine and Epidural I awoke properly at around 6pm last night and my first words were I Want Toys…..I want Toys….I want Toys…I Want Toys! It was quickly explained to me that I cannot sit up or move a great deal, so I settled down to a few books as a compromise and allowed Mummy, Nana Pam and Nana Diane to read a few lines each when I called their name. So I can be monitored closely I am on a open ward which is very close to the nurses and have quite a few babies close by which I love as I love little babies, I’m not sure if Daddy is so keen on the crying through at night. Not that we got any sleep because every hour throughout the night I was woken up and asked to wiggle my toes, bend my legs and ice was rubbed on belly to see if I could feel it. This was fine upon until around 2am when even a patient girl like me got fed up with the routine. Imagine being woken up at 3am and told to wiggle your toes whilst you felt awful. I must admit to being a bit of a rebel and said no to all questions and simply requested that I wanted to go to sleep. As for today I still feel a little groggy but guess that’s down to the morphine and epidural but at least I don’t feel any pain. Mummy was a little worried about me because I kept getting a little twitch in my arm today but I’m sure it’s nothing to worry about. I’m quite excited about tonight though as word on the street is that Daddy’s friend Simon has dropped off loads of presents from people through Post Pals. I will thank you all properly tomorrow and let you know what I got and maybe even a picture of me. Samantha returned after around 5 hours and is very sleepy; our little girl has wires coming from everywhere now. As you are all aware by now she has her NG Tube in her nose and 2 little wiggleys coming out of her chest but now she also has wires coming from her hand, foot and back too. She is also on morphine and epidural to stop any pain caused from the operation, however enough of the bad stuff, you will be glad to hear that the operation went well and was a success. The team that was operating on her did not need to remove a kidney and they believe they removed the entire tumour which is fantastic. Samantha is very tired and will be for a few days, but sure she will be back with a few stories of her own very soon. Arrrrgh! This sickness is driving me nuts now, last night was my worst night and I was sick every single hour during the night. I can handle the sickness but getting no sleep is starting to get me down a little as I just feel tired all the time. Doctors think it may be the tumour lying funny in my stomach, so hopefully things will be much better after Thursday when I get this nasty tumour out of my little body. We had some bad news today, as I have suffered a slight setback in my treatment. The Doctors have advised that the results of my Bone Marrow scan have come back and they are still showing traces of the cancer. This means that they will not be able to perform stem cell rescue (transplant) after the operation and I may have to endure more chemotherapy. Over the next few weeks we will be advised on what treatment and options I have ahead of me, but feeling a little down, knowing even after my big operation, my uphill hill battle against Neuroblastoma still has a very long way to go. Not the best of days I’m afraid but not being the kind of girl to feel sorry for myself, I will just carry on with a song and a smile and feel more determined than ever before to beat this nasty disease. I’ve been very poorly lately with sickness and I have shingles. I have finished my chemotherapy and my tumour has shrunk, we are waiting to be told if my bone marrow is clear. The Doctors said my big operation to remove the tumour will be on February 9th, so I’m starting to feel like my battle against this nasty disease is moving forward. Samantha made it home Christmas Eve night and was able to wake up Christmas Morning and open her presents from Santa like most children. She was so happy, playing with her brother and even sat down and tucked into Christmas dinner at the table with everyone, complete with party hat. Unfortunately she had to return to hospital Christmas Day night and has been in and out since. Chemotherapy starts on Friday so it’s New Years Eve in Hospital. Thanks to Georgies Fund for support, huge thank you to Lauren my Elf this Christmas who sent the biggest box of gifts from USA which had so much time and effort put into. Grafton Junior School, thanks to all the children who made Samantha Cards. Julie Barrett who made Samantha Pal of the month on her card making site and Samantha had so many cards everyday. To each and every person who sent a card, e-mail, or gift which kept Samantha smiling throughout a difficult Christmas in Hospital, thank you. You guys really are stars of the brightest magnitude, I have witnessed first hand the joy and pleasure that you bring to a poorly child’s face and it’s a magnificent sight. Samantha was so sad some days but her smile lights up the room when we bring her cards to open of gifts from Post Pals. We appreciate it more than you can possibly know, to put a smile on a child’s face is priceless. Had my worse night yet since treatment began last night as my temperature remained over 38, Blood Pressure is still very high, sickness and diarrhoea all night long. Despite being only 2, I’m a big girl and never wear nappies, however for the first time last night I had no control at all and had to wear nappies again, which is something I don’t like doing at all and got a little upset about. I woke up in a great mood thanks to so many people at Post Pals who put so much time, effort and thought into sending me cards, presents and e-mails. I had so many special gifts I had a smile on my face all morning and will be thanking you all very soon. My Post Pals Elf Lauren deserves a special mention for sending a HUGE box of goodies all the way from USA, there was lovely drawings and pictures all over the box and the thought that went into the box and its contents is appreciated more than you know. This also goes to everyone who sent cards. In the afternoon, I became very poorly and my temperature rose to 38.9, I also became very sick and my infamous NG tube came out again. If that wasn’t enough I’m also having a nasty time with sickness and diarrhoea. I have felt poorly all day. Round 5 of Chemotherapy has wasted no time in knocking me back. Mummy had a little scare last night when I appeared to have a reaction to my medicine or food again and went straight to sleep and awoke very teary. The Doctors kept me off my feed last night and monitored me closely but I’m fine again, so it’s business as usual today. Although feeling good, it time to prepare for yet another bout of chemotherapy again. The Doctors also revealed that my tumour before treatment was approx 6×5 inches but the Ultrasound scan now shows it at around 3×2 Inches which is fantastic news as it shows the treatment is shrinking the tumour as planned. We are still awaiting the Bone Marrow test results though but I will keep you all posted. Daddy’s friend tells me I have 2 massive parcels from Post Pals and loads of cards too, so quite excited about opening them too, sounds like some more fun pictures coming your way. I was sick again last night and my NG tube had to be pushed back in for the 2nd time within a few hours, something that I don’t look forward to at all, my screams could be heard throughout the ward as it wasn’t very nice at all. Daddy and me then slept until 09:15 am this morning, and I woke up to CBeebies with a song and a smile, so looks like I am in for a good day if that’s anything to go by. A huge thank-you to the mum of Pal Daniel B, who sent me a lovely present. She very kindly brought me a lovely new doll, and we all know I have a soft spot for dolls, my new doll has been keeping me company in my hospital bed with me. Viks at Post Pals also sent me some cool gifts including a wicked glow stick which I had a good old fashioned rave with. I hear that I have some more prezzies coming too! What a lucky girl I am, I will let you know as soon as I open them, YIPPEE! Despite problems with my blood pressure I am home from hospital for the first time since November 5th! Having a great time playing with my brother and decorating our Christmas tree. I have to return to hospital at 8pm Sunday night to be wired back up to the machines again. I will be in hospital all week again as the Doctors will be performing various tests to see if it I am responding to the treatment, so keep your fingers crossed for me. I can confirm that I have Chicken Pox! I have now been moved to a different hospital ward to my own room and not allowed to leave the room, so things could get interesting over the next few days when they try and stop me sneaking out to the playroom. My chemotherapy (round 4) has been postponed at the moment and I am now on even more medicines to get me well again very quickly so they can resume treatment. Since joining Post Pals in 2008, Rhianna has had her diagnosis chaged from Diamond Blackfan Anemia to Aplastic Anemia and Polyarteritis Nodosa. She has recently had a bone marrow transplant. Rhianna was diagnosed with Diamond Blackfan Anemia in December 2007. Rhianna had been unwell for several months previously, but no one knew why and put it down to a viral infection. Rhianna was taken seriously ill in December 2007 and after a blood test which was taken on the afternoon of the 6th of December 2007 we received a phone call from the GP asking us to take her straight to the local children’s ward as her HB was only 4.3 (normal is above 13). We stayed in the hospital for 4 nights before being transferred to a specialist children’s hospital where Rhianna had numerous tests done for bloods before having a bone marrow biopsy and a blood transfusion. Rhianna started steroid treatment in January 2008 and had fortnightly visits to the hospital. As they were reducing the doses her HB kept falling so it was decided that Rhianna would have regular blood transfusions and see how things go. She is currently going every 3 weeks. We are very sad to say that Rhianna passed away today. I’m still in hospital with Rhianna. They’ve put her back on antibiotics and increased steroids. She is still very poorly but has managed to sing and jig about for few minutes to her iPod. Hopefully we’ll be in theatre on Thursday, unless Professor changes his mind again!! We are still in Sheffield and will be for the next 10-14 days at least as Rhianna is still being treated for Adenovirus, Pneumocytis, Candida and Aspergillus. She is now on complete gut rest and is starting back on TPN! She had a nasty 2+ hour long nose bleed on Saturday and is very down mood again, although still not complaining. She is going to have a 2 unit blood transfusion tonight which will be the first one since having had the transplant. A huge thank you to everyone who has sent Rhianna e-mails and cards, it’s so lovely that people can take the time to do this – it really does put a smile on a child’s face. Rhianna is still in hospital and is a little bit better but still has a long way to go. She is being treated for Aspergillus in her skin, Candida in her Gastro/ Digestive tract, and if that isn’t enough, on Monday we were told that they think she has Pneumocytitis in her lungs. They wanted to do Bronchoscopy on Monday but it was too high a risk and the anaesthetist refused as said she would have ended up in ICU on a ventilator. So things very much up and down and we feel like we are on a roller coaster. On a plus the transplant has worked!! Despite all this Rhianna continues to smile (though not as much) and not moan. Rhianna is still very poorly in Sheffield on M3 and we’re unsure when we will be able to bring her home. After the skin biopsy she had last week she got steadily more unwell, her heart rate has increased and her Sats have decreased and she is requiring lots of oxygen to make her comfortable. They have found Aspergillus on her biopsy and think that she may have this on her lungs but are unsure but treating it anyway. It is very hard to treat and sadly can be fatal so we are hoping that she will continue to fight it. All we can do is sit back and wait and provide continued love and support. Please can you update Rhianna’s page for us to say a huge thanks to everyone who has taken the time to send us all post and some lovely gifts. I will continue to keep you updated over next few days. Rhianna is doing really well after her BMT. Although she is still very tired and is still not able to do a lot or go out in crowds. Sheffield are really pleased with her, the cells are all donor cells and for the first time since Dec 07 she has not needed any transfusions!! She is really grateful for all the lovely cards and gifts she has received and we are slowly going through all of them and will be sending thank you cards out, although it will be a lengthy job!! We are so sorry to hear of the sad losses of Sophie, Madison and Holly. Just to let you know that all is going to plan with Rhianna. Thanks for the cards and for the chocolates and updating this wonderful site. I would just like to say a big thanks to everyone that sent Rhianna and John cards and presents, its very kind of you all. Rhianna keeps going to hospital as her platelets are dropping quickly. She goes in on the 5th January for pre conditioning prior to BMT on 15th January at Sheffield Children’s Hospital. Rhianna is going to have a Bone Marrow Transplant at Sheffield Children’s Hospital in January. Things are pretty hectic here as we are backwards and forwards to the hospital as her HB and Platelets keep dropping. She has also got a fractured right ankle (which local hospital missed and told her to walk on as nothing was wrong) and is in pink pot at the moment and struggling to do anything as she has problems with her left ankle too! So, good old Sheffield are sorting that out for her too. Unfortunately it is a 4 hour round trip just for a quick appointment though! She has good and bad days but never complains about all that is happening to her, she is a true inspiration to us all. Rhianna really enjoys receiving post and is just in the process of getting together some gifts to send to other Pals. Rhianna’s diagnosis has changed from Diamond Blackfan Anemia to Aplastic Anemia and Polyarteritis Nodosa, as this is what she has now been confirmed as having. Rhianna has continued to have monthly blood transfusions and recently platelets as well, due to low hb and platelets dropping to silly numbers like 14 and 8! Sheffield asked Newcastle to have a look at Rhianna and see if they could offer any answers, as Rhianna did not respond to the Chemo and is still requiring transfusions, and also because of platelets that were ok at the beginning of July but suddenly dropped towards the end of July. We are currently anxiously awaiting the results from Newcastle which we should receive by the end of this week and with them will hopefully be a plan of action. They have said that she MAY need a Bone Marrow Transplant to help her, so at present we are in limbo land and just trying to function as best we can as a family. The summer holidays have been very hard for Rhianna as she has not been able to do a lot with her friends (that should be the one friend that has bothered). It is heartbreaking to see her so down as she cannot walk far and refuses to go in a wheelchair in case her school friends see her. She cannot go swimming because of the risk of infections and everything else costs a fortune. On a positive note, she says a BIG THANKYOU to you for the lovely cushion that you sent her, and to everyone who has taken the time to send her cards and letters, especially the children in America. Rhianna is going to write to everyone who has included their address but it may take some time. Also, she has been given a beautiful yorkie puppy that is now 17 days old and has his eyes open. He is called Sonny and is her motivation at the moment. Thanks for all the hard work that you do as you really do make a difference to Rhianna. Thank you for all the cards and letters Rhianna has received this month. Thanks to Post Pals for the gifts we have all received from you too. Rhianna is currently undergoing monthly blood transfusions and chemotherapy. Although she is still smiling and laughing it really seems to be taking it out of her energy levels and she is not bouncing back as quick after her transfusions. If anyone else knows of anyone Rhianna’s age with Polyarteritis Nodosa could they please contact us. Rhianna now has a second health problem. She has Polyarteritis Nodosa alongside the Diamond Blackfan Anemia and started Chemotherapy yesterday. She would like to say a huge thanks to everyone who sends her post and will reply to everyone who has put their address on. Nathan passed away on the 21st of November 2006. Nathan was born on 10th January 2003 weighing in at an impressive 10lb 6oz and continued to grow and thrive with no major health problems. Then when he was 10 months old he developed little lumps on his head and body, some slightly orange, which didn’t go away. Four months later, he was diagnosed with Juvenile Xanthogranuloma (JXG) although we were reassured that the lumps were self-limiting and would disappear when he was four or five years old. During the following 6 months I noticed that he had cafe au lait marks, which can be an early indication of Neurofibromatosis 1(NF1), a condition linked to JXG, as is Juvenile Myelomonocytic Leukaemia (JMML). I began to worry! Although he continued to thrive and there was no outwardly signs that Nathan was seriously ill, a blood test taken by chance when Nathan had diahorrea revealed that his blood counts were seriously wrong and a couple of days later, I received the devastating news that Nathan had leukaemia. Worst of all, it was a rare form of leukaemia which accounted for only 1% of childhood leukaemia’s and the survival rate was only 40% and that was with a bone marrow transplant. Nathan has had an indolent form of the disease and so we spent the first 18 months after diagnosis, watching and waiting with the hope that he would stay stable indefinitely, as can happen in some cases. During that time, he didn’t need treatment, just regular checks, so hospital visits and finger pricks are second nature to him. Around this time, NF1 was confirmed but the only problems it seems to be causing are poor balance and motor skills. About six months ago his platelet count started to fall and once it hit below 40, he was referred back to the bone marrow clinic where the decision was taken in April 2006 to go ahead with the transplant. We knew from earlier tests that his sister Jessica wasn’t a match, but have been so very luck that we have been able to find an unrelated donor. In preparation for the transplant, Nathan has had a bone marrow harvest, will have a central line inserted during August and hopefully the transplant will go ahead in September. Meanwhile, Nathan is doing OK. He has a big tummy due to an enlarged spleen and he bruises very easily. Since the NF1 makes him fall over a lot, it’s not a great combination! It will be hard starting the treatment, knowing that it’s going to make him so very sick when he looks pretty much like any other lively little three year old. We think that the odds for beating the leukaemia are better than they were two years ago, but 50:50 is still terrifying me. It seems like forever since I last held Nathan. It’s only been 8 months but it could have been a lifetime ago. Jess and I are trying to reform our lives and while the grief of losing Nathan is now a part of our everyday life, we try to bring some joy in to our lives too. It’s become very important that we remember how blessed we were to have Nathan, even for such a short while. I just don’t want his legacy to be the devastation that cancer brought into our lives; I want to remember what a beautiful, happy little boy he was. We have just taken part in one of Cancer Research’s Race for Life events and I was so proud because our race was dedicated especially to Nathan. Jess and I set the runners off and were given star treatment by the organisers. We were even interviewed by TV and newspapers which was nerve-wracking for both of us but it kept us occupied, less time thinking about the races in the previous two years where Nathan was there to cheer us on. I’m so proud of my children and was more than happy to show everyone what amazing children they are. Jess will be starting senior school in September but right now she’s just looking forward to the school holidays. It’s hard to find new things to do together, we try to avoid the places we used to take Nathan because its times like that when we feel his absence most. We’re so grateful for all of the Post Pals post we’ve received since Nathan’s death, its amazing how thoughtful people can be. Thank you all for your support. 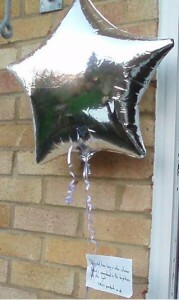 Post Pals released a balloon for Nathan, one one side it had his name and the date, on the other it had the quote “Its not how long a star shines, what is remembered is the brightness of the light”. Sadly the treatment was too much for Nathan’s body to handle, he passed away in his Mum’s arms. Nathan had his bone marrow transplant on 20th October 2006. This involved a week of really intensive chemo to stop his own bone marrow working during the run up to the transplant. During this time he was relatively well although he did have some nasty reactions and sickness. We then moved to isolation where we had to have really strict procedures to limit the amount of infection Nathan was exposed to including restrictions on visiting and disinfecting everything that entered the isolation room. The transplant itself was a bag of stem cells, donated by a stranger who I can’t even begin to thank, which were transplanted into Nathan by a drip feed into his central line. It took two and a half hours and was pretty straight forward; Nathan slept through most of it and was totally unaware of what was happening. The last two weeks following transplant, Nathan has been at his lowest as he waits for the new cells to engraft while his own cells are totally wiped out. Unfortunately he did get a chest infection and so far three infections in his central line, so he has been spiking temperatures for almost a week now, although they are getting less frequent and less severe. The skin across his torso was burnt pretty badly from the chemo but I think that it is finally starting to heal, and his hair is almost completely gone. All in all, it’s been a tough time so far, but the good news is that in the last few days his blood count has started to make a dramatic improvement, which means that the donor cells are starting to engraft. Good news because the transplant is working so far, but also good because Nathan can start to heal. Nathan has amazed us all by being discharged from hospital and is doing well. He has recovered from his splenectomy and the mild chemo he is on is managing to control his leukemia for now. He still needs close monitoring as his platelets are still low and he has needed plenty of platelet transfusions, although he has managed on his own for over a week now, so perhaps we have turned a corner. He isn’t eating so relies totally on tube feeding which has been a big adjustment for me as well as him! The great news is that we have a new date for the bone marrow transplant and all being well, it will happen on 20th October. Of course, we have been here before and given that it’s the season for coughs and colds, I won’t quite believe it until treatment actually begins. We will be admitted on 12th October to begin a week of really intensive chemo to wipe out his own marrow before the transplant of the new stem cells. Even though he’s still weak and has lost a lot of weight, Nathan is getting back to his normal, chatty self and it’s only now that I can fully appreciate how ill and in how much pain he must have been in recent months. Its nice having the real Nathan back again, even though I know we are still only building him up to knock him down again. He’s enjoying receiving his post and pretend reads them all. He knows they are from some really nice people who are all willing him through this. Thanks to everyone for the post and we are trying to send our own personal thanks when we can. The next few months are going to be unimaginably tough and we’ve been overwhelmed by all the fantastic people we now know are out there supporting us, thanks to Post Pals. Nathan was due to have his bone marrow transplant at the beginning of September but his leukaemia has progressed at a frightening speed in the last month or so. We have been in hospital for the last couple of weeks due to a chest infection and although his temperature was brought quickly under control, his spleen has grown to such a size that it is really making him miserable. He is in pain from his leukaemia too so now has continued pain relief. He isn’t walking or moving around very much and he’s all but stopped eating so now has a nasal tube to feed him overnight. He started a low dose chemo which has softened his spleen a little and helped with his blood counts, but his platelet count has remained dangerously low and regular transfusions just seem to go straight to his spleen. Add to this, his central line was inserted less than a month ago, and we have certainly had a lot of adapting to do in the last few weeks! His doctors have now taken the very difficult decision to postpone his transplant, mainly because of the problems the spleen is causing. So now he is about to have his spleen removed which is a big operation because its so big but will hopefully improve things and give Nathan a chance to build himself up again. The new date for the transplant is being organised but obviously we have to arrange things with the donor too. So we are expecting to stay at hospital for the foreseeable future but are thankfully being looked after really well by family and the staff at the hospital. Hopefully, the transplant will only be delayed a matter of weeks but right now we just have to concentrate on getting Nathan through the splenectomy and back to his usual happy self, if only for a short while before transplant! Thanks for all the post which Nathan loves opening and for Chemo Duck. I hope at some point in the future to have the chance to send individual ‘thank you’s’ but please know that your kind wishes are appreciated! Megan is a bright, happy, smart, courageous 11 year old girl. In her short life she has had 18 operations on her brain, spinal cord and legs. In these last two years alone she was in hospital for two months for brain surgery, then four more times for spinal and tummy operations. She is about to be admitted again for a very big scoliosis surgery. 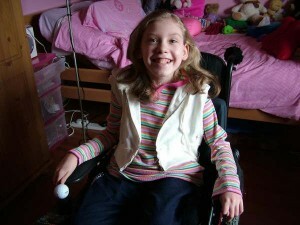 Megan suffers from, Spinal Bifida, Chari malformation, syringomyelia, VP shunt, Spinabifida, Scoliosis, Osteoporosis, EDS. Megan was operated on when she was a few hours old for spinabifida and hydrocephalus and had a VP shunt put in and back surgery. She was very mobile and we were given a very positive prognosis and were told she would probably not need a wheelchair as she walked well. Things were great until she was almost four and she began to fall down a lot and had problems swallowing. An MRI diagnosed Chari and Syingmyelia. This is a group of conditions in which there is an abnormal collection of CSF fluid within the spinal cord. It is progressive and degenerative with no cure. It can destroy nerve endings and cause severe chronic pain and muscle wastage. Megan even had eye and facial pain. Megan has since had two posterior fossa decompressions and many other head and spinal operations. She has had to let go of a lot of her independence as her shoulder and hips have dislocated and her legs no longer straighten out. She has had to have a gastrostomy as she cannot eat and swallow. She developed severe osteoporosis when she was 7 and this past year scoliosis, which has accelerated so fast that she now needs rods and screws pit in to stabilise her spine. She also has a pain pump administering medication directly onto her spinal cord inserted. 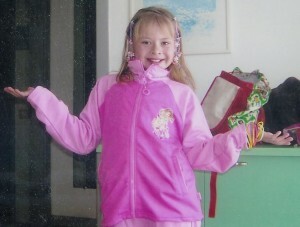 She is an intelligent hard working little girl who has made up all her time in school and is about to go to high school. I just want to thank all of you at Post Pals and ask if you would put a wee message and one of these photos on Megan’s site for a wee while longer as there are so many people to thank who all were so very kind to Megan. You all really cheered her up and the hospital stay which was so long was brightened when the postman would come to Megan’s room. He said she was the most popular girl in the hospital. Special thanks to a boy called Jason Norris and his girlfriend who sent loads of books and Megan was thrilled. Also Claire Connor who was writing a lot in Megan’s last few weeks. Megan developed autonomic neuropathy as a complication of her advanced syringobulba. Her brainstem involvement was causing everything to shut down and the messages from brain to heart, respiratory systems etc were not correct. There were times when her beats per minute were the usual 115 and then they’d plummet to 66 and then race to 133. She developed severe swallowing problems around December and her stomach was no longer absorbing anything. She couldn’t take anything enterally, even meds, and all had to be administered through a central line to her heart. Her intestines bowel and gall bladder were also not functioning properly and the peristaltic motion was not happening. This caused great difficulty with her sitting up and she eventually couldn’t do that. Her brainstem was really stuck down and tethered and her spine was deteriorating rapidly. Unfortunately 2 years ago when we found the specialists in Liverpool the damage had already been done here and the csf had been locked inside the complete spinal cord all the way to the brain. Our doctor in Liverpool managed to do the surgery Dr. Frim recommended and probably gave her these last 2 years but he couldn’t reverse the damage that this awful condition can cause. In her weakened state in May, Megan got silent pneumonia but managed to rally back. Even being stuck in bed she managed to make the best of any good spells she got. She was very close to some of her nurses and spent time chatting and teasing them. We knew we needed to get her home and luckily managed by air ambulance. She got to spend time with her friends and family doing nails, chatting, girly quizzes and movie nights in her room. This was lovely but also heartbreaking. She died on June 24 with us all around her in her little pink room playing music and holding her hand. At her celebration of life ceremony we had her favourite music, poems, and friends sharing memories and then we let go lots of pink and red balloons. She would’ve liked that. So many people spoke of her bravery and how she had touched their lives. We have scattered her ashes on the beach with flowers and balloons and now we are supposed to go on and try to live without her which is impossible. Megan getting ready to go shopping with friends. Just a quick note to let you know that Megan passed away at 8.17 yesterday. We greatly appreciate all the gifts and kind thoughts sent to her by everyone. Just a wee note to let you know that we finally got Megan home last week. Its been a difficult week getting all the equipment, nursing and medical supplies in place but well worth it to give her some quality time with her friends at home. We can’t thank all the people out there who were so thoughtful and kind enough to send Megs those special little (and some not so little) packages. It really cheered her up, particularly on the down days when it seemed that getting home was never going to happen. We now plan to make the most of whatever time Megs has left in the more relaxed and comfortable environment of her own home. No sign yet of Meg getting out of hospital. It will probably be another 4 weeks, we hope. We are sorry to report that Meg is still in Alderhey. The consultant cancelled the air ambulance home 24 hours before we were due to fly. He wasn’t happy with her level of pain. They are now introducing local anaesthetic into her baclofen pump to numb the pain in her legs. The first 2 trials didn’t work and trial number 3 is tomorrow. The plan is to come home 17th April but we are not confident it will happen as progress is slow. Please convey our thanks to everyone who sent Meg such lovely gifts. They were very much appreciated and helped to give Meg a lift at a very difficult time. Megan is still in Alderhey. Not doing too good. The operation to remove the femoral head has led to calcification in the tissue around the bone and is causing a lot of pain. Coincidentally her bowel stopped working while she was in hospital and there appears no obvious reason. No bacteria and no obstructions in her bowel have been found. The believe it to be a form of autonomic neuropathy where the nerves have been damaged and are either not working at all or inconsistently working. She had to have a broviac central line put in and is now iv fed. We are now waiting for a package of palliative care to be organised to enable us to bring her home. As she can’t sit up it will have to be by air ambulance again. Wish I had something more positive to say but she’s having a very difficult time. Megan is currently in the neurosurgical unit at Alderhey hospital in Liverpool. She has been there since last Monday and will be there for a while. Her symptoms have worsened in recent months. The consultants are carrying out a number of tests and consulting with other specialities to try and find a way forward in her treatment. Megan’s system is shutting down and causing problems with her breathing, body temperature control, and even digestion. Swallowing is difficult and she is having eye problems again. Her consultant said there isn’t any fluid around the brainstem so he will need to do a very precarious brain operation. We are just waiting on a theatre date right now – Megan hasn’t been told so please don’t mention it in cards. As always thanks for all the lovely cards she receives we are very grateful. I just wanted to thank everyone who has sent cards and wee surprises to Megan. We really appreciate all the lovely cards etc. and want to make sure we thank you all. We will try to send extra thank you’s to those whose addresses we have. Megan is planning on her own wee thank you notes but wanted me to thank everyone. So to Kat, Julie, Alan, Becky and Caroline – loads of hugs from Megan. Megan has had some sleepless nights and is nervous about more surgery and having these parcels arrive with all your lovely good wishes really picked her up. Matt was a perfectly healthy little boy, when sadly at the age of just 22 months, he was diagnosed with a malignant brain tumour measuring 4cm x 5cm in the back of his brain. He underwent 7 hours of surgery, after which he lost the ability to walk, talk, eat, even move, and had to be fed through a peg into his tummy. At the same time Matt had to start an intensive course of chemo lasting 14 months to try to kill off any remaining cancerous cells. Matt spoke for the first time 8 weeks after surgery; it was such a long time waiting to hear his voice. With sheer determination that Matt is famous for, he also learned to walk again, albeit unsteadily, but to him he can run as fast as anybody when he is one of his Ben 10 characters! Matt finished his chemo in March 2008, he relapsed shortly afterwards so needed more surgery then 6 weeks of radiotherapy. We had a fantastic year tumour free but during a routine scan it was discovered he had relapsed again. More surgery followed, followed by another relapse. Within 6 weeks the tumour was back again and this time Matt’s doctors felt that the tumour was too aggressive to justify putting him through surgery again. Matt has fought so hard over the last 3 years and we still hope for a miracle. Matt is on chemotherapy. This is not curative but is hopefully life prolonging. Dan now feels ready to move on from Post Pals. He has loved getting post from all over the world and it has really helped him when he desperately needed support. He is an amazing 14 year old and we are so proud of him. Thanks for all your kindness. It is with a heavy heart that I’m writing to tell you Matt passed away at 17:15 yesterday evening. He was so so peaceful and we were all with him, in true Matt style he had us all organised and made sure that we were all there with him. Matt is spending more and more time in bed at the moment, he is awake but because of the pressure in his head he finds it very difficult to sit up. We are seeing little changes everyday, but he is comfortable and still ordering us all about, which we love. He keeps telling anybody who visits to ‘get out the way of my TV!’, the steroids are making him a little stroppy!!! He loves his post, he has been inundated this week and we have had lots of lovely memory making moments, seeing him smile with his letters, cards and pressies. Even the postman has commented on how much post the boys have had!!! We are in the process of making the picture frame that was sent to Matt, we will be putting a special family photo in there. He loves his sticker books as he can lie in bed and make those. Dan has had lots of smiles this week too. A special thank you for the cards I have received too this week, thank you for thinking of me. You have all helped to make some special memories for us and for that we are very very grateful. Matt had surgery in November to remove his tumour, and recovered brilliantly. Over the last 2 weeks he has gone downhill massively, unable to swallow and lethargic. An emergency MRI was done yesterday and it has shown that the tumour has invaded Matt’s brain stem and surrounding area. This has grown so so quickly, that nobody, not even the doctors, expected this. He is comfortable and having a good day today. His doctor has given us a prognosis of a few weeks with him. It’s hard to believe whilst he is sitting here playing on his playstation. Just wanted to let you know that Matt is going in for surgery on Tuesday and we have to be admitted on Monday. He is getting a lot of headaches and neck pain from the tumour at the moment. It has been manic this month. It was a definite no to re irradiation so we are currently looking at alternatives to try and stop or slow the tumour. A massive thank you for all of Matt and Dan’s post over the last month, the boys have loved all of their post. It has been a manic month; we have had an amazing trip down to London to see the Lion King and to visit London Zoo where we were able to feed the tigers!! The boys had the most amazing time and were totally worn out by the end of it!! Matt has also had a scan and we got the results on Friday. The tumour is continuing to grow and I think we all knew this as he is showing more signs of weakness down his left side and his walking is becoming more difficult. We have decided to stop the chemo as it is so obviously not working, and we don’t want to be putting things into his body if it’s not doing anything. Rob and I are going down to London to get a second opinion with regards to Re-irradiation and this should be in the next couple of weeks. Matt’s surgeon has suggested that we could take the tumour out again (this will not cure Matt, as surgery on its own won’t get rid of it) so that we can have more time with Matt. I would give my right arm for this, so that is also in discussion at the moment. It has all been really draining for us but as usual Matt and Dan just get on with it!! On a brighter note, a huge THANKYOU for all the wonderful cards, postcards, letters and gifts the boys have received this month. They have been overwhelmed. I am just so thankful to everyone who puts the time and effort into thinking of the boys. I normally like to thank everyone individually on here but there has been so much wonderful post this month that it would take up a whole page!! All of the cards and gifts are kept and used and Matt especially loves his fab Mr Men gifts from Ireland, thank you. Our furthest postcard was from Australia and we have also had a couple from Denmark!! Post Pals is going global!! Matt continues to ask ‘is there anything for me?’ every time the post comes!! A big thank you from the boys and much love from us. Matty is great in himself, although his consultant is convinced that his tumour is growing. He has been to school two afternoons this week – he loves school so much and he is so pleased to be in class 2 – I wish his ten year older brother was as keen to go to school!! We are now awaiting a brain and spine scan to get an up to date picture, if this still shows the tumour can be taken out again the Prof has suggested we do this and re irradiate. We have options again, what a feeling!! This doesn’t come without its own very serious risks but if we don’t go for this Matt will die. Please keep your fingers crossed that the scan shows we can do this. As I’m writing this, Matt, Dan and dad, are fighting on the sofa, such a simple thing but so special. Now for the most important bit – Matt has been overjoyed by his letters, cards and presents. His usual response is ‘wahoooooooooooo’! He loves it and we would like to say a massive thank you to Sheelagh for all the Dottie Dalmatian stories and most importantly our new addition to the family ‘pluto’. Thanks also for the footie doorbell, Dan and Matt spent at least a good hour recording and re recording messages, much fun was had by all. Thank you for the lovely letter from ‘Percy’ too, a very handsome chap. Thanks go to Mandie in Ireland for the fab pictures, card and toys, the time spent making the card makes it very very special, thank you so much, Matt has decided that his turtle is a Sea Turtle. I will update again when I get some more news, but just to say thank you for making my boys smile and for all the time and effort that you all put in to thinking of them. Hi there, my name is Madison and I live in Staffordshire. I am 2 years old and live with my Mummy, and my sisters Lauren (14) Megan (7) and Tyler (6). On 1st February 2008 my left leg started to hurt me so I went to the hospital for some tests. I had an MRI scan and was then diagnosed on the 18th February with cancer. I have a Rhabdoid tumour in my left pelvis capacity. I have been to Birmingham hospital and our local hospital the City General where I have started chemo. My hair fell out but it doesn’t bother me. I just want this horrible disease to go away and be able to walk again. I have lots of support from all my loving family and friends. Madison has a very rare, aggressive type of cancer. The tumour has shrunk with chemotherapy which the doctors didn’t think would happen as they gave her 6 months to live back in February. She is awaiting radiotherapy to try for a cure but the doctors have said her chances are very slim. If the radiotherapy doesn’t work we will loose our daughter to this horrid disease. Annette, Megan and Tyler (mum and sisters of Madison) would like to say thank you to those who sent post and gifts to mark Madison’s 4th memorial today. It means a lot to know she hasn’t been forgotten. The girls really appreciate the post they still get, thank you. We are so proud of the send off we gave Madison yesterday. Thank you to everyone who joined us and for all the beautiful cards, flowers, donations, and special gifts. Fly high now Madi, we are missing you so much. Madison’s funeral will be held on Friday 26th march 2010. Please meet at Central Hall Methodist Church, Longton, at 11.15am. Burial will take place after the service at Fenton Cemetery, Fenpark. We will then be celebrating the life of Madison at the Poole Dole pub, Fenpark Road. Please wear something bright and flowers are welcome or donations to the Donna Louise trust via Tim McGough funeral directors, Tunstall. Details will also be in tomorrow nights Sentinel paper. Madison is still fighting but remains in a deep sleep. Just to let you know we are still at Treetops and tonight Madison has taken a turn for the worse. She is stable but very weak and sleepy and not very aware of her surroundings. The doctors have decided its best to up her ketamine pump and her diamorphine pump to quite high levels and she’s also having sedation. In the morning they are going to catheterise her as her bladder is becoming squashed by the tumour causing extra uncomfort of her bladder. She’s very swollen now and it’s getting very difficult for us as we can see the tumour damage. She’s black and blue over her buttock and leg, her hip is triple the size it should be and she’s got a new large lump in her back. Madison’s cancer is spreading very quickly now and we only have days left with her, maybe a week or two maximum. We are so heartbroken but we’re staying strong for her. We have no more to say but will update when we can. This is a very scary time for us as Madison could pass away at anytime. Madison is now tired and not well. She’s hooked up to a diamorphine and a sedative drip and we know we don’t have much time left with her. We are at the Treetops, Donna Louise Hospice, where Madi will pass away. Thank you for all your support and beautiful letters and cards, we have put them all on her room wall. Madi has had a rough day. She has been suffering with laboured breathing and wheezing. She had a chest X-ray which showed some mucus, but mainly that the cancer is causing her breathing problems. We are devastated after meeting with Birmingham consultants. Madi is too poorly to continue the trial. There is nothing more we can do for her. All we can do is comfort her until she slips away. Madison remains in hospital as she is still really poorly. She is also still on tpn and 5 different antibiotics, spiking temperatures, having lots of runny nappies despite being nil by mouth, and having blood traces in her urine too. She is still having lots of samples checked to see if they can find an underlying reason. We have asked about a scan this morning but the doctor feels she is not well enough to tolerate it yet. They have upped her ketamine once again as her pain is still bad. We are hoping to get her more comfortable even if it means lots of pain relief as the last thing we want is for Madison to suffer. She has her bright moments and yesterday she had a bowl of snow in her room to build a snowman. On Friday, Alex Winters from cbeebies came to visit her and she loved it!!! She got a very special signed photo. Thank you to all the people that have post to the children. They have learnt to smile again – it makes a big difference to them all to feel special. We went to Birmingham last week (as you may of read from the last update) and have been back again today for Madison’s mri of her pelvis and the CT of her lungs and chest. Unfortunately we didn’t see the doctor so we don’t have any results as of yet. Madi coped really well with the anaesthetic and was a really brave girl. She should be on line to start her new chemo next week in Birmingham but we don’t know what we’re dealing with until we get the results. This is still a hard time for us and an anxious wait. I’ll update as soon as the results come through. Just to let you know that Madison is doing much better now and is over her recent illness. We have been to Birmingham today to sign the consent forms for her new chemo trial and to have baseline bloods done, kidney function tests, and an echo and eeg. She was really good and kept really still. We get the results on Monday when we have to go back for her mri scan. If all is ok, she will start her new trial the week beginning 1st February. It is an excited but apprehensive and nervous time for us too. I’ll update again on Monday to keep you informed. Hi everyone I hope you have all had a fantastic Christmas. We got our wish and spent it at home all together. The children had a great day and they all had lots of lovely presents. Madison’s favourite was her drum set and her electric princess scooter, Megan’s was her guitar and Tyler’s was all her tinkerbell stuff. It’s going be a bit noisy in our house!! On Boxing Day we had a play day where the kids got to go through all their presents and enjoy them. After dinner Madison spiked a temp and became quite snotty, she had a really bad night and continued to spike temperatures. This morning, after 25 minutes sleep, I changed her bum and noticed some spots on her – after checking her over I noticed the poor little mite had chickenpox!! We have been up to the hospital to the doctor as Madison is really unwell at the moment and she has been given 2 lots of antibiotics, as not only does she have chickenpox, she also has severe tonsillitis and very swollen glands. The doctor said she will get worse before she gets better, so we have got to keep a close eye on her and will have to take her up if she becomes really unwell. I’ll update in a few days to let you know how she’s getting on. We have just got back from Birmingham Children’s Hospital where we have been to see Madison’s consultant and research sister. After a very long discussion, we have decided to go ahead with the trial for a new chemo for Madison. She will start around mid January after having some more scans, a new cl put in, a biopsy, and a heart scan. The chemo she will be on is new and hasn’t been used before so we are hoping we get some pleasing results. We do have to remember that there are no answers to this trial, so it might not do anything whatsoever for Madi, but I will continue to hope and pray it does. Madison will have to spend 3 days out of 21 days at Birmingham hospital for treatment, she will experience most of the side effects she has before and may loose her hair again, but if we don’t try this then we lose her anyway, so I’m sure that accounts for the side effects. Madison will now stop etoposide as she has to be chemo free for at least 4 weeks prior to starting the trial. At least now we know we are going to be at home for Christmas and the New Year and are going to have a really amazing time. I have just had my Christmas present of good news and couldn’t wish for anything better. I just wish Madison the best of luck and pray this will be her miracle. Madison had an mri scan today and we are totally devastated by the results. Her tumour has grown and spread, there are more tumours in the area now too and lymph nodes. Life is so cruel, i feel so numb right now knowing my little babe can’t beat it. So sorry to post bad news. Thank you for all the recent post. Madison is still in hospital on Ward 112 as the other swine flu swabs came back to confirm she definitely has it. She won’t be allowed back on Ward 110 until she is symptom free. She is really poorly at the moment with it and has just started with more of the symptoms. She’s on Tamiflu still but had to go back on 1st line antibiotics yesterday as she spiked temperatures above 38. She is also neutropenic so has no immune system to fight it. She is being recanulated every day as they keep tissuing so her little hands and foot are black and blue. The doctors have decided they want to do a long line as she’s running out of veins to use. She still has c diff which is giving her horrendous diarrhea meaning her weight is dropping and she also has septic tonsillitis still. Things at the moment are rough and its horrible being in isolation. I’m doing good and coping really well with all this, however i really miss my children as they aren’t allowed to visit. We are banned from any visiting at the moment. Just a quick update to let you know Madison is in hospital and has been since last Wednesday night. She has got a bad throat and cough but is doing ok.
We will be staying at the hospital until we get more support at home as things are very difficult for me. I have been hiding behind a false smile pretending to cope alone, but can no longer carry on as it has made me ill too. Sorry it has been a while since I last updated but a lot has been happening. Madison has been back in hospital as the pain got really bad. They have started her on ketamine and we seem to have the pain under good control now. CONGATULATIONS to Madison as she started school on Monday. She only goes for an hour as she gets very tired, but we are so proud to see Madison reach this milestone. Madison is at home with us now and won’t be going back to the hospital until needs be. We are hoping to have lots of good times with her. I’ll update again really soon. We would also like to say a big thank you to Margaret for the lovely gifts you sent to us. Madi is going back into hospital to start Ketamine again as she has had a bad couple of days with pain. Last night she was hallucinating and tripping really badly for hours due to medication, there wasn’t anything to reverse it so we had to just ride it out. Madison is back home now. She’s doing ok but is declining quickly. It’s her birthday tomorrow, thank you everyone for her post, she’s going have an amazing time opening it all. I will email some pictures to Viks. Your support has been amazing; I’ve read Madi all your messages and she listened with a smile on her face. We are going to print all her messages off as keepsakes for her. The doctor came see me yesterday; we are living on borrowed time now and we could lose Madi anytime as her breathing is bad when asleep. The oxygen will help for a small time. Just to let you know we made it to Disneyland Paris with Madison. 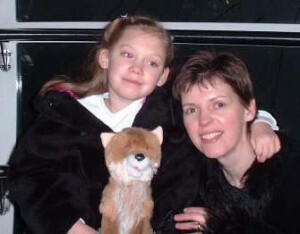 Despite being in pain she had a fantastic time and it’s a memory that will never die 4 us. She is ok but on lots of medicines now. It is unlikely that the etoposide chemo is working to slow the cancer down as she has swelling in her back now too. Will keep you updated as often as i can and thank you for all the post she has been sent. Madi had her scan and the results confirmed the tumour is growing. Madi will only have a few months left to live and we are devastated. Sorry it has taken me a while to update but Madison is still in hospital. Last week she was thought to have swine flu so had to have a week of tamiflu. Luckily the tests were negative. Madison is experiencing severe pain now and is on very high doses of pain relief. She has to be sedated when the pain gets really bad. She had a blood transfusion in the early hours of Wednesday morning as her blood pressure and hb dropped very low. Her resps and sats drop quite low too and the doctors warned me that she could stop breathing any time. Madison is having a big scan under GA at 4pm today to see what is going on in her little body. We are hoping to have some indication tonight which will tell us what the future holds, although the full reports will be early next week. Madison is very unwell and getting weaker. I’ll update again later when we know more. Love to you all and thank you for all your lovely messages. 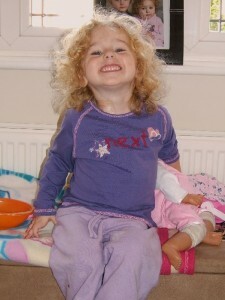 Madi was taken poorly on Wednesday morning and was kept in hospital. She is in a lot of pain and has a new lump at the front of her pelvis. After her scan it was confirmed that it as another tumour and the cancer has spread. Madison is still very poorly and on high dose morphine which they are changing to fentonal today. We are unfortunately going to loose Madison but do not have a time span as yet. She will be rescanned over the next 2 weeks to see how rapid it is growing. I’m sorry to have to tell you this. As you can imagine, we are heart broken and completely devastated. Madison is in todays Sentinel paper. Madison is still requiring hospital treatment for oxygen management as she still has a collapsed lung caused by pneumonia. She has had a brain, lung, and full body scan to check for any spread. We had the results back and all the scans were clear, so we now know we are only dealing with the cancer that has returned to the pelvis. Lauren, Madison, and I went to Treetops last week until Saturday, then returned back to the hospital. Madi went to Birmingham on Monday at 7am to have a central line refitted as the doctors are keen to restart chemo as soon as possible. The next few months are going to be really difficult as we know the chemo is going to make Madison very ill. This is the only chance we have though so i’m preparing myself for whatever it takes. Madi will lose her beautiful hair again, so if anybody wants to buy gifts then please do join us in our summer hat collection. On Monday Madi was seen by a few doctors and then taken to the surgical ward. She was put to sleep in theatre and had her new central line fitted. She was very brave and did really well. Her consultant then came to see us and explained that Madison will have 2 new chemos starting on Monday for 5 days, then 21 days off, then another 5 days chemo. After the 6 weeks she will be rescanned, they will do a full body scan, bone scan, lung scan, and brain scan, to see if there is any latest spread. She will also have a repeat MRI of the hip/pelvis where the tumour has returned to. If there is no change to the tumour or any spread, then treatment will be stopped. If there is an improvement to the tumour and no spread, then they are going to plan surgery. This surgery will be very major surgery to remove the leftside of the pelvis. It will be a very long and complicated operation and will leave Madison fully disabled and will cause later problems to operate on. We also have to concider if she will be strong enough to undergo the operation and also consider the cancer returning to another location once the pelvis has been removed. It is going to be a very hard meeting in approximately 6 weeks time. I will keep you informed as much as i can. We went to Birmingham today about Madison’s scan results and the results from her last scan were devastating. Her cancer has returned and the prognosis is very poor. She’s having a lung and chest scan tomorrow to see if it has spread and a body scan nxt week. She will go back to Birmingham in 7/10 days to have a central line put in again and if there’s no spread they are going to start chemo again, although she will only have a 1% chance of it working. If it has spread then they are going to start pallative care chemo. I’ll update as we get more info but unfortunately things are looking very grim. I’m so sorry to have to tell you this news. The family and myself are absolutely devastated, but i will fight this with her all the way! Please keep praying that 1% chance will be Madi. Madison was rushed back into hospital in the early hours of Friday morning following 6 fits and a high temperature. She is being treated for viral meningitus and also has pneumonia. She is really unwell at the moment and is on oxygen. She’s had lots of scans done and an EEG which we are waiting for the results of. We hope they won’t be too long. Sorry it has been a while since i last updated but Madison has been back in hospital for a while. We are home tonight on ward leave but have to return at 9am in the morning. Madison had a very nasty infection in her hickman line (candida) which then spread to her blood stream and she went completely off her legs again and was in agony. They have now got her on a level amount of morphine and painkillers. She managed to stand again yesterday and walk a bit today after having some steroids. They are now concerned the infection has gone into her hip bone causing septic arthritis so will be doing an mri scan really soon. She has been a lot better since they removed the hickman line last Saturday as an emergency and luckily we have the pain under control now. She is still on antibiotics at the moment and will be for a couple of weeks yet. Today we took her to the pub for lunch then shopping and she loved it! So did i! Thank you for my growing egg and my sisters say thank you too for theirs. We will have fun seeing whose grows the fastest and will take some pictures. Madison and family will be on Central News tonight at 6pm. Look out for your post again! Unfortunately Madison continued to be unwell last week and had to be admitted to hospital on Friday. Her temperature shot up and she was really unwell. She then had a swelling come up on her left cheek. She had an ultrasound scan and it showed a mass but they are hoping it is part of the infection she has, as at the moment she has a nasty blood infection. Today her left foot and leg started to swell too so they took her for an x-ray and again it is infection attacking her weak spots. She came home tonight but has got to have daily ivf antibiotics by the community team. She’s not too bad, just a bit sleepier than usual. She’s going back in on Friday morning for an mri scan under general anaesthetic. They are going to scan her head, face, leg and foot, to make sure there’s nothing nasty there. We are doing a video tomorrow that you will be able to see on The Sentinel site and the latest news page on Post Pals. We have done lots of celebrating and are starting to enjoy life again! We have had a surprise phone call from the hospital. We had Madison’s LP results back and she’s now clear. MADISON IS CANCER FREE NOW!!!! She did it, she beat it!!!! We have been the hospital today and they have stopped all treatment. They are hoping to take her wigglies out in approx 6 weeks, she will have fortnightly check ups, and will be closely monitored to check nothing comes back. Let’s pray it stays away!!!! We are over the moon and will be arranging a big party at a later date. We hope you will all raise your glass to Madison to congratulate her. We have been to the hospital today for Madison’s occupational therapy appointment. The doctor was lovely – he put a plaster cast on Madison’s leg and she loved it, she even bore the pain of putting her ankle at 90 degrees. She got to pick some designs too for her new splints and she’s having a butterfly design to wear during he day and a red with teddies on for night times. Madison has got to wear a splint on her left leg as the cancer and the chemo and the radiotherapy have killed the muscle and tendons and her main sciatic nerve is damaged, so it is important to wear a splint to help her leg develop again if at all possible. If this doesn’t work then Madison could be looking at lots of operations and a lot of time in real plaster cast! After the appointment we went to the ward to have her bloods taken. They are really good and her infection markers are low too which is very reassuring. I had a long chat with the doctor too and he made things a lot clearer. Madison has two lesions on the membrane of her brain which suggests viral meningitis has been a complication. The LP she’s having on Thursday is to determine which type! They are also going to test her salts to see if it’s another tumour site, but think it is unlikely the marking in her leg is still showing some. It could also be showing bruising and swelling from the chemo and radiotherapy. They say there is no spread and are happy with her. They may have to change her chemo again but they will do what’s best for Madison pending the LP results. The doctor said he hasn’t said the words remission because he doesn’t believe she is until 5 years of no change! Madison is doing well and isn’t facing a bad prognosis but a good one! If it comes back they will decide what to with it and then treat it however they can. He explained that cancer never really goes away and it is finding a way of controlling it until the tumours don’t come back. I’ll keep you updated as to what they find after the LP on Thursday. Hi there everyone, my head is a bit clearer now as I’ve had a talk with Madison’s oncology nurse. When Madison was in hospital a few weeks back she was very poorly, she was having lots of vacant episodes and at times was not with us. The doctors did a chest x-ray and it was really nasty so they treated her for pneumonia. However, it wasn’t just pneumonia she had, she also had viral meningitis. When they did her remission scan they also did a brain scan and it has showed up 2 shadows on her brain. They are going to do a lumber puncture to see if it is the meningitis that has caused it or if it is something new. There is no obvious evidence of any large tumours but it does need to be investigated. On the MRI scan Madison had on her pelvis there is still something showing up, but again there is no large tumour or evidence of any extra growth and so this is why they will not give Madison her remission, as the scans were not all clear. She will continue on the chemo she’s on for approximately 12 months and she will have scans regularly to make sure there’s no change. The doctors are also going to keep a very close eye on any new symptoms. Madison will not have the all clear until the scans have showed no further growths over the next 5 years. We have just got to keep fighting this and pray the lumber puncture results are better news. We had Madison’s results yesterday evening and Madison is not in remission. The doctors have also said from the brain scan that it is not pneumonia we are dealing with and is viral meningitis. I am having a meeting with the doctors this morning so hopefully we will know more later today. Madison is back in hospital with pneumonia after having a massive fit and a storming temperature. She’s on IVF antibiotics and oxygen but responding ok. She’s still having lots of absences and is going to have an EEG. She’s very poorly but the doctors are sure she will pull through. Megan says thank you for her birthday cards, she had a good day even though she had to spend it at the hospital with us because of her sister. Hi everyone, sorry we haven’t had chance to update for a while but Madison’s eldest sister (Lauren) has been in hospital for 2 weeks. She has a twisted ovary that is in the wrong place and a large cyst in it. She is having an operation on 19th February. Madison is still doing really well and is getting stronger each day. She has a cold and bad chest at the moment but is doing well with it as luckily it’s just viral. On Christmas Eve Madison went for chemo at the hospital and we got her results. Unfortunately, they could not give her remission as the scans she had done showed too much swelling from the radiotherapy. She will be rescanned in February when everything has settled down. So the scan results were inconclusive. Then later on Christmas Eve, Madison was rushed in to hospital with a raging temp of 40.8. She came home at 12 o’clock Christmas Day on penicillin for tonsillitis. At 7pm on Christmas Day we had to take her back in as the hospital rang to say her line was infected. On Boxing Day we came home again and at10pm we went back in for treatment. At the moment Madison isn’t too bad, her levels have dropped and her line has staph in both lumens, so she is being treated at home with iv antibiotics and we are hoping to have New Year at home. Madison would like to say a very big thank you to her elf as she loved her presents and thanks also to everyone else who sent her a gift. Her sisters were very pleased with their presents and say a big thank you as well. We hope you have all had a fab Christmas – the best part of our Christmas was going to Lapland as it was like a fairytale come true and we were in it! Happy New Year wishes to you and our love and very best wishes to each and every one of you. Merry Christmas to you all! I have just come back from Lapland where i have been for 4 days with mummy, nanna and my sisters. We have had the most amazing time ever and we met Santa and i got a very special present from him. I have given him my list and he has promised i will get everything on it! So will mummy and my sisters too! I have told him about all you special boys and girls and he will be looking on here tomorrow and making sure he comes to your house! How cool is that?! Well, to all my friends on here, have the best Christmas ever! To all the staff and elves and reindeers, have a very happy Christmas and a very happy New Year. I’ll be posting on Christmas day as i get my results from my post radiotherapy scan and am praying for my remission… wish me some Christmas luck! Hello to all my friends! I’d like to say a very big thank you for all my letters, cards and presents that my sisters and i have received. We have put our Christmas presents under our tree ready to open Christmas morning and we will take some photos of us opening them and send them in. I have been quite well the last few weeks although the chemo upsets my tummy! I am going to Birmingham on Thursday for my post radiotherapy scan and mummy is praying that my cancer has all gone. I hope your Christmas wish comes true mummy!! We should know the results very soon after Christmas. Well done Post Pals on your award, it’s truly deserved. Thank you again to everyone who has sent me mail and gifts, you have really made me smile. I am now having maintenance chemo and i have been having it for a week now. I’m neutropenic again but mummy is making sure nobody infectious is coming around me, although it’s hard because we like visitors and normal life! I went shopping with mummy last week and loved it; i even got to pick some of my Santa presents! I can’t wait to go to Lapland in December and i thank mummy for getting this dream together. I love you mummy and love all my new friends on here, lots of you have made me smile. I have just come home from hospital after spending another month in there. I have had 6 weeks of radiotherapy but got a line infection so had to go in to hospital for some antibiotics to help me get better. I then got a really bad burn from the radiotherapy on my bum! I am ok now but I’m tired and sore and I’m neutropenic so need some TLC from mummy which i never go short of! Thank you for the cards i have had since being in hospital… i will send you all a Christmas card very soon and will write back to the lovely letters i have received as soon as a i can. I’m in Take A Break magazine this week (issue 46) if you want to read about me.